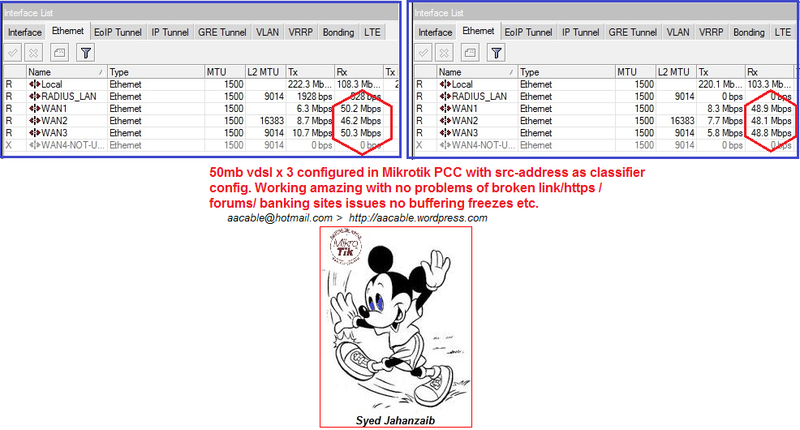 Mikrotik PPPoE Server | Syed Jahanzaib Personal Blog to Share Knowledge ! 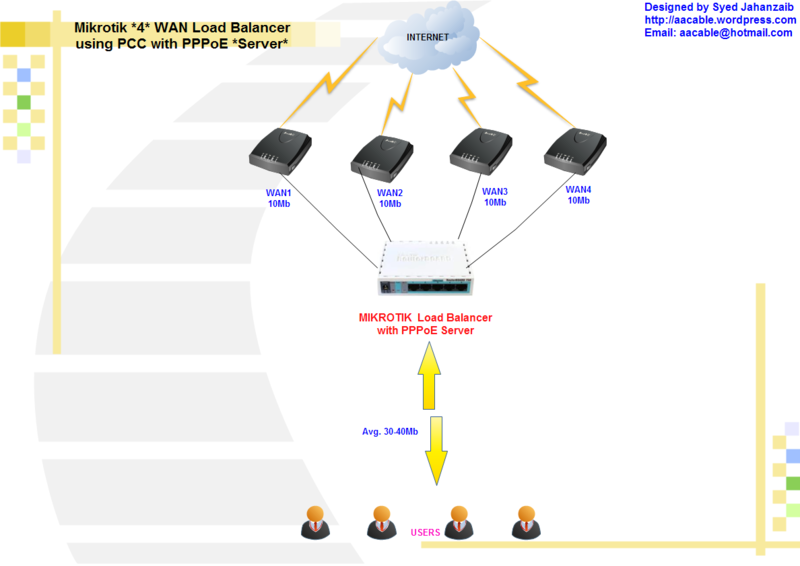 Load Balancing Users Among Multiple PPPoE Servers on Same LAN ! 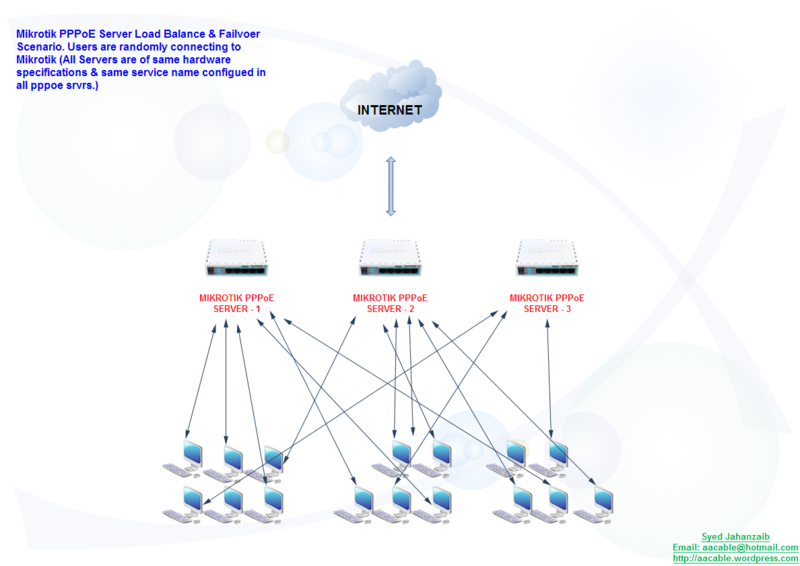 Following are few simple tips N tricks on howto load balance users among multiple PPPoE Servers working on same LAN. The PPPoE Client sends out a service inquiry and whichever mac address responds first is the one it tries to connect with. This is the easiest way to load balance PPPoE. adn the public ip pool should be different as well. # From Each client, the two pppoe servers must be reachable at L2. # Each client can connect randomly to one pppoe server or the other. there will no FIXED percentage, but in practical it maybe around 60-40% or 45-55% sort of. The PPPoE Client sends out a service inquiry and whichever mac address responds first is the one it tries to connect with. # If one server is Down, All users can Connect the second one or Only available Server. Howto scan pppoe servers running on your Network. it will show you all the servers running on this interface connected network. Howto create PPPoE Dialer Installer Package using Auto-iT ! 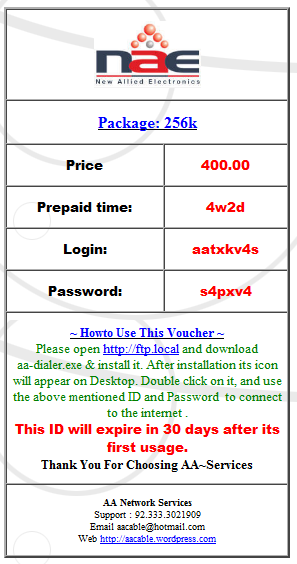 OLD METHOD of autoit, may not work proeprly so use above mentioned link. I am basically a Networking type guy who is heavily involved in Microsoft / Linux + Mikrotik Environment and I have no background experience in any programming language , that’s why I asked many people for assistance , but none of any knew about it, and those who knew, didn’t wanted to share the code with general public. ; Wizard Complete, do we want a desktop shortcut? Now click on ‘aa-dialer-install.exe’ and it will install the pppoe dialer and place its shortcut on Desktop. 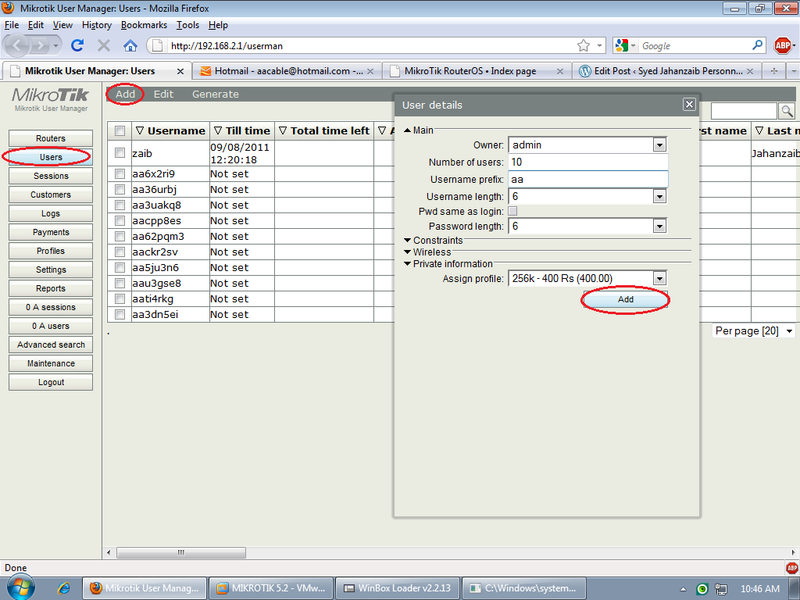 Following is my personnel experience / Guide on Howto configure a mini ISP type Network using following scenario . . . . 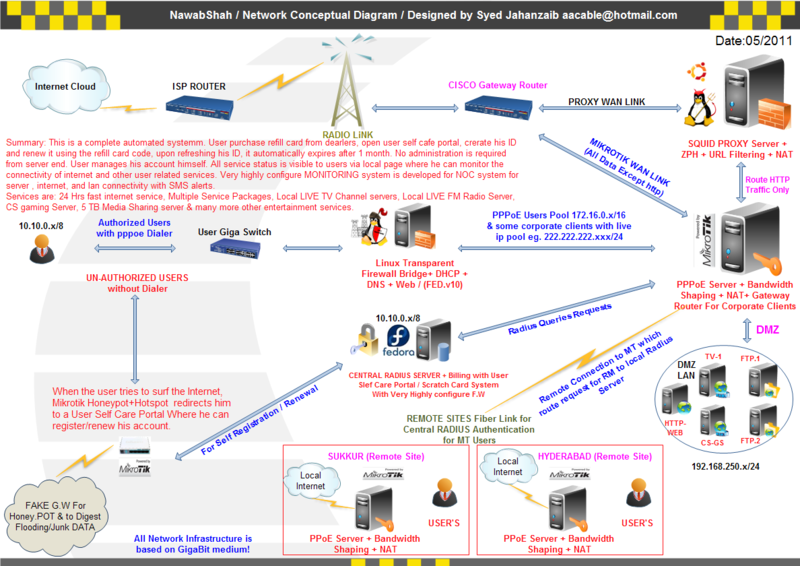 Recently [Year 2010-2011] I was contacted by a friend who was really passionate in starting a mini–ISP type network setup for about 1000 users in the interior area of city. (soon it may expand up to 2000+ users). He asked my help to setup a scratch card base fully automatic system where user purchase scratch card, & using User self care portal web site, user may create his new ID or refresh his previous ID or change the service package according to the card package offers. 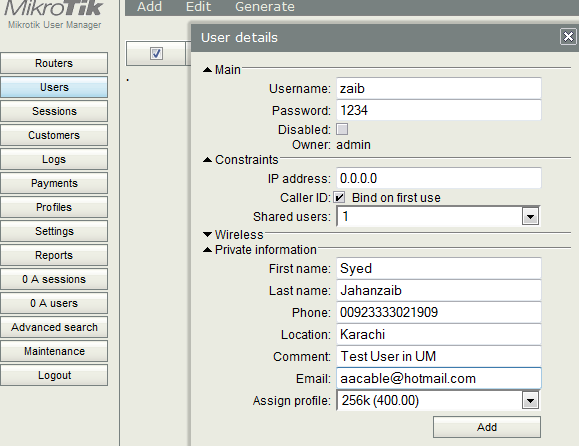 I had previously setup this kind of scenario in a cable.net environment using Mikrotik built-in radius server called ‘User Manager’, but it have very limited basic features and all it can offer was a pre–paid type option and it doesn’t have many accounting features. So I thought I should give a try to more rich feature radius server and after a lot of googling i decided to go with (FREERADIUS base ) DMASOFTLAB RADIUS MANAGER. A very famous radius billing linux base server with all the option that a mini-ISP would required at unbelievably low price. * SQUID PROXY GW = SQUID v2.7 on UBUNTU Karmic Koala v9.10 / Xeon 3.6Ghz Dual / 8 GB Ram / WD 500 GB x3 SATA HDD (2 HDD reserved for Cache), This server acts as a proxy + Gateway machine for the Mikrotik, It also do URL Filtering blocking ads, it also have ZPH enabled so content available in squid cache should be downloaded at full speed (without package limitation) at user end. About RM: Radius Manager uses a nice web interface for administering the users and the whole system (traffic accounting, tracking of online users, display statistics, maintenance ,account management etc.) and to add that DMASoftlab customer support guys (specially Mr. Viktor.K) have excellent support and respond instantly even to the dumbest of questions. It is real value for money especially for those who do not have big budgets. We will distribute this article in following sections. 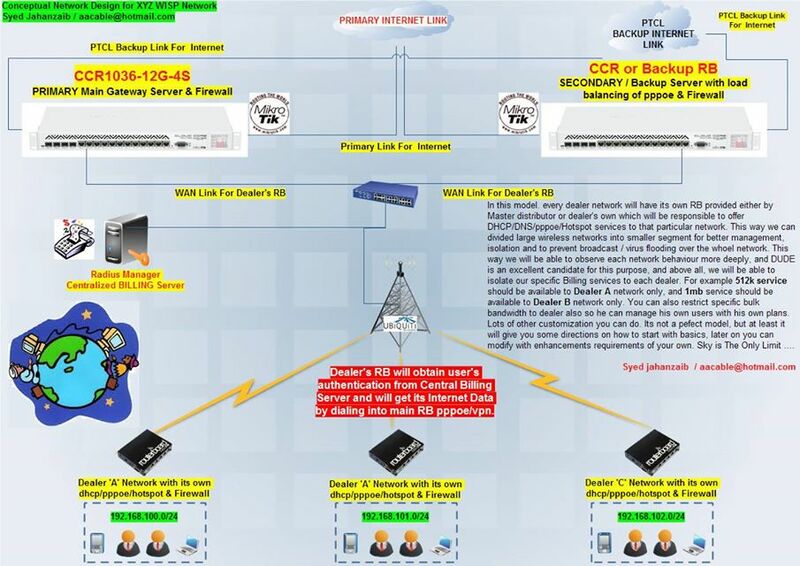 3) DMZ interface = Connected with FTP Server’s Switch or via Crossover cable if there is only single ftp server. For various reasons, I am not sharing exact Mikrotik Configuration. Just a basic modified version. # User gets ip from these pools as per there packages, Just to locate and for some record purpose. # Unlimited Speed for CACHE content to be delivered to users at LAN speed regardless of there pcakge. ## Unlimited Speed for CACHE content to be delivered to users at LAN speed regardless of there pcakge. # Logging features, I used to have 14 lines, with all necessary info written to DISK for record purpose. # Marking various packets like http, cache content, ftp etc . 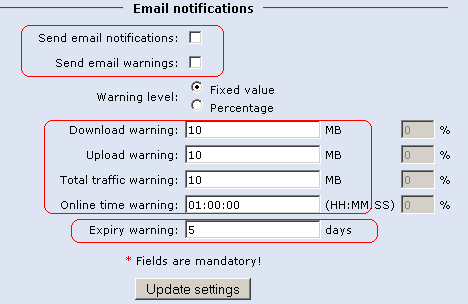 . .
For General Mikrotik configuration, Please read the following post. 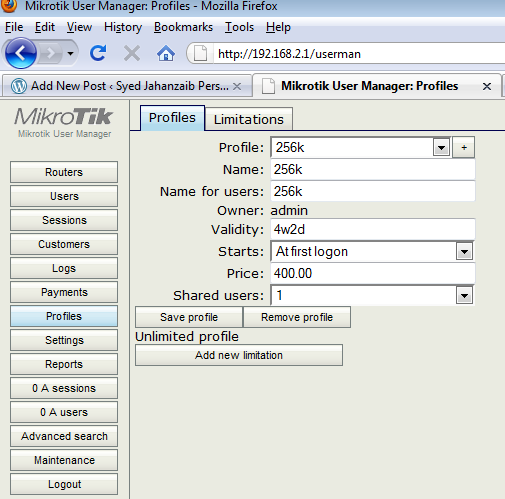 For User ip redirection to SQUID configuration in Mikrotik, Please read the following post. 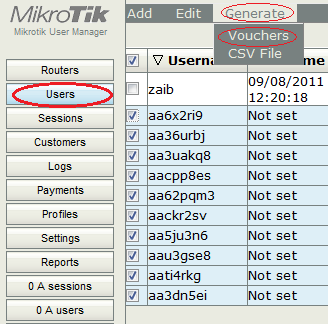 For FTP queue exemption in Mikrotik, Please read the following post. SQUID Server have two lan cards. Other is connected directly with Mikrotik with cross over cable. and paste the following content in it. The above script will share internet connection on this BOX. add it in /etc/rc.local so it may run every time system restarts. For fine tunned squid.conf , I used the following modified version. /etc/squid/squid.conf withe the following data. # I have set 200 GB for caching, Adjust it according to your need. For Basic Internet Sharing on Linux , please read the following post. For basic SQUID configuration , Please read the following post. For fine tuned squid.conf, Please read the following post. This RM installation guide is a shorter version, copied from DMASOFTLAB RM original manual. I edited it and cut off all un-necessary paragraphs which are not required for basic installation and added some info of my personnel experience. For RM Screenshot gallery, please visit following link. 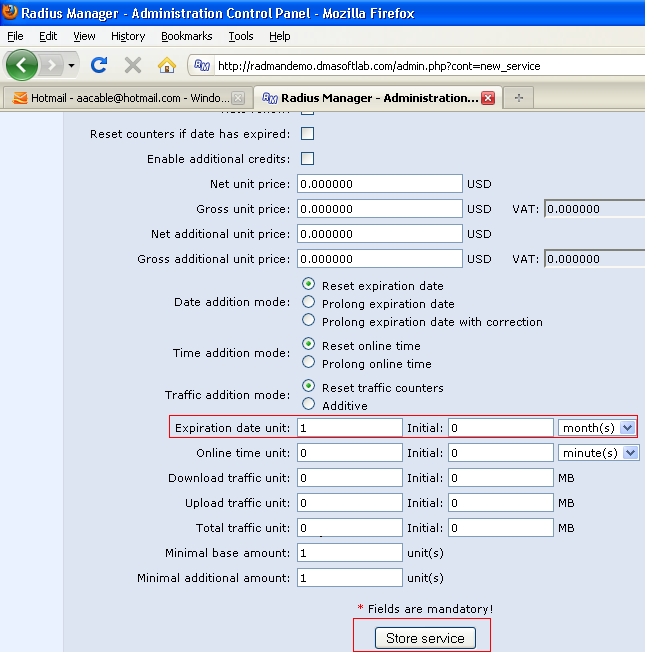 This document describes the installation procedure of Radius Manager billing system on a Linux host using FEDORA 10. For beginners I recommend the usage of Fedora Core 10. Fedora Core is the easiest and the most comfortable Linux system for RM isntallation (Although I have tested in Ubuntu also, but still FED wins in few aspects) It comes with all required packages to install and run Radius Manager. The packages are available on the installation media and they are also down-loadable from the official online repositories using the Yum tool. 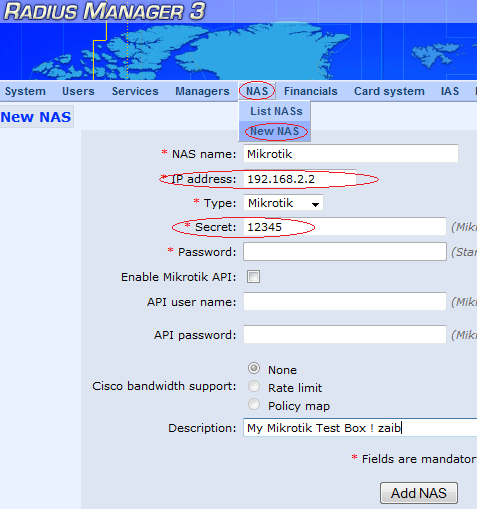 In this document You will also find guidelines on how to set up your NAS (mikrotik) to integrate with Radius Manager system. Install the necessary components on your Linux host before You begin the installation of Radius Manager. You have to see the ionCube PHP Loader version displayed correctly. 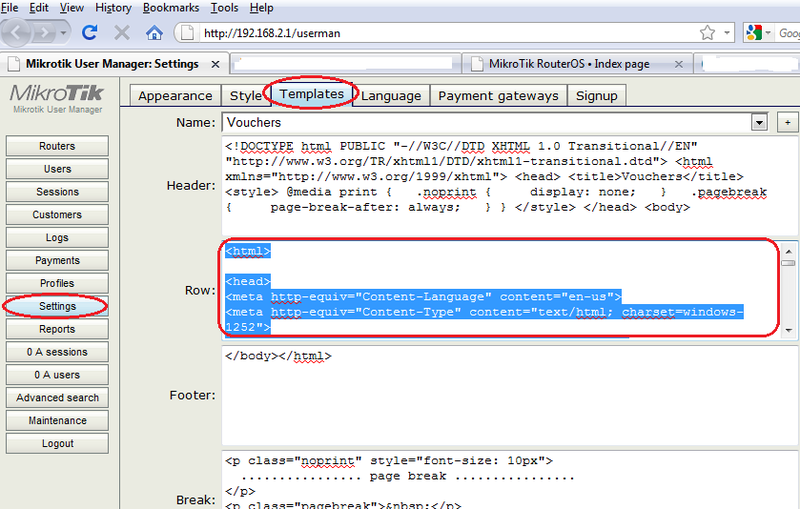 with the ionCube PHP Loader v3.3.14, Copyright (c) 2002-2010, by ionCube Ltd.
6. Now it’s time to request a license for your server. If this is first time, Ask support@dmasoftlab.com to grant you id passwrod for customer portal. after getting Id, Log on to DMA Softlab customer’s portal (https://customers.dmasoftlab.com) and request a trial license for the hardware address (MAC address) of your network interface card. Radius Manager will run only on the specified host and the license is binding to the MAC address of the network interface card. You can migrate Radius Manager to another host if You also move the same network interface card with it. It is strongly recommended to request a license for a removable networking interface to allow migration to new host without loosing the license. 7. When a license file is issued (You will get a notification about it in email), download and copy the lic.txt and mod.txt to radiusmanager web directory (read the “Installation procedure of Radius Manager” chapter of this manual) to enable licensing of your Radius Manager installation. If encoded files fail to run, you can test ionCube runtime by using the helper PHP script ioncubeloader-helper.php, which is included in the loader download archive. 1. Copy the ioncube-encoded-file.php PHP script to your http root (on Redhat-based system it is /var/www/html). 3. If You can see the message “This file has been successfully decoded. ionCube Loaders are correctly installed”, it means You have successfully installed ionCube runtime on your host and it is ready to use. If You can’t decode the file via a HTTP call, check the php.ini and be sure SeLinux is disabled. Follow the installation steps to successfully build, install and configure FreeRadius RADIUS server on your host. Use only FreeRadius 2.1.8 DMA mod 2 source archive (downloadable from our site). It is prepared and tested by our team and it is 100% compatible with Radius Manager. Other versions and builds will not function properly with Radius Manager. If your host already has a different FreeRadius version installed, remove it completely including it’s configuration files (/etc/raddb or /usr/local/etc/raddb). By default, FreeRadius will be installed in /usr/local directory. It must answer with “Ready to process requests”. 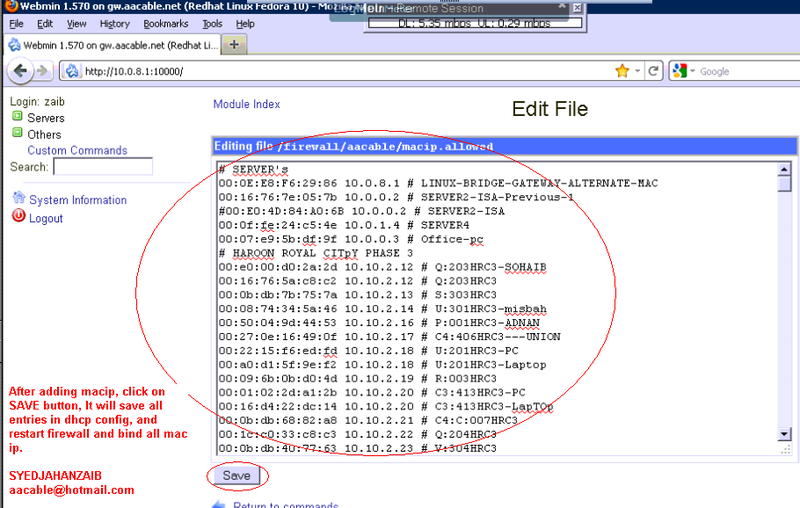 If radiusd cannot find the required libraries, issue ldconfig from shell to refresh the ld linker’s cache. 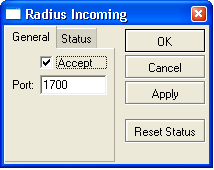 Radius Manager updates the clients.conf automatically, so it is necessary to set the correct permission on it. Do not modify the clients.conf by hand. Don’t forget to define all NASes in ACP with the correct secret and restart FreeRadius (from ACP or from shell) after modifying the NASes in the system. Completing this step the databases are ready to use. 1. RADIUS – for storing all system data, including users and accounting information. 2. CONNTRACK – for storing connection tracking system (CTS) data. Create both databases even on a non-CTS enabled system. 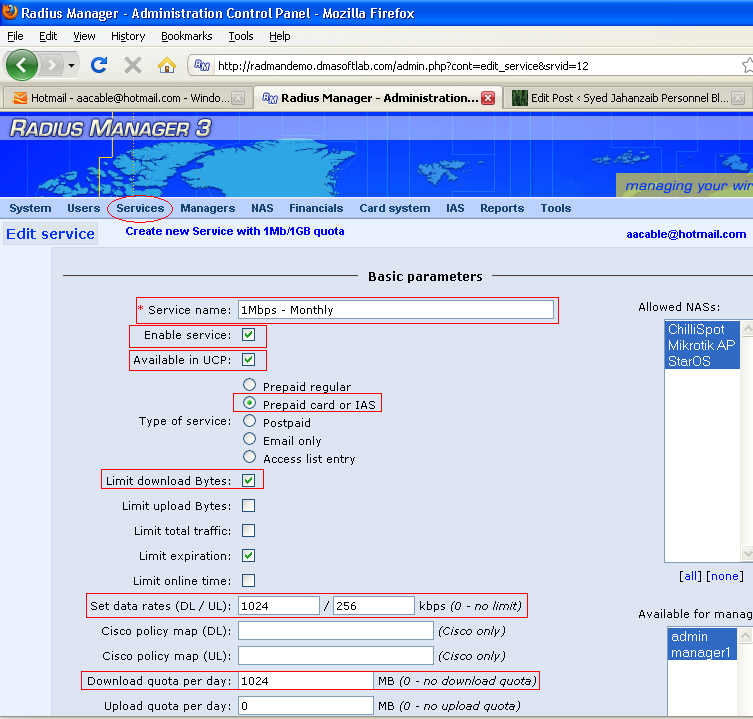 Now download RM (radiusmanager-3.9.0.tgz) from dma customer portal in /temp folder. Now decompress the Radius Manager tarball using following command. Now invoke the installer script, but first change its permission to 755. In the examples below we will use the installer script on Redhat / Fedora system. Copyright 2004-2011, DMA Softlab LLC All right reserved. Select the operating system You have. For Redhat, RHEL, CentOS, Fedora select option 1. For new installation, use option 1. You can see the default options after every question, so You can just press enter in most cases. Now define the HTTP root folder. The installer will create radiusmanager subfolder in it automatically. On Redhat You can simply press enter. For the default setup simply press enter and use MySQL user “radius” with password “radius123” for RADIUS database, and conntrack / conn123 for CONNTRACK database. The host is “localhost” by default. If You have different setup, specify proper values. If You are planning to use the system with hundreds of online users, it is recommended to use separate database host for CONNTRACK database. In the next step You have to define the FreeRadius user. It must be the correct user to set the permission properly on /etc/radiusmanager.cfg. If there are permission problems on /etc/radiusmanager.cfg, Radius Manager binaries will not function at all. On Fedora it is root, so simply press enter. Now define the HTTP user (the user name under Apache is running). It is required to set the permission on files in radiusmanager/config directory. On Fedora it is the apache user. You can now decide to create rmpoller service or not? It is a standard Fedora / Debian compatible service script which invokes rmpoller helper. You can also start rmpoller using alternative ways. to control rmpoller service activity. Also make this service auto starting at boot time together with FreeRadius. Use command chkconfig -add rmpoller on or use Webmin to activate the service at boot time. 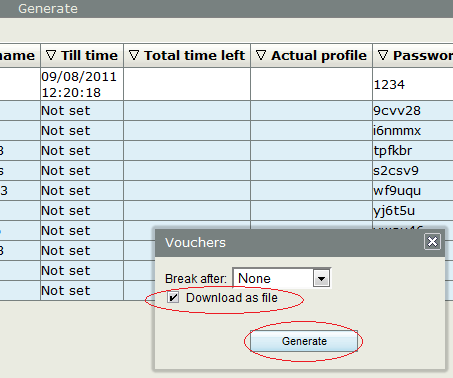 In the next step select yes if You want to create the rmconntrack service. It is a standard Linux service, like rmpoller. It is required for Radius Manager CTS only. to control rmconntrack service activity. Also make this service auto starting at boot time. Now the system warns You it will overwrite the existing databases if You continue. Press ‘y’ to continue or ‘n’ to abort the installation process. WARNING! If You continue You will overwrite the existing RADIUS database! You can press Ctrl+C any time to abort the installation process. the installation process is finished, You can begin configuring the system with /etc/radiusmanager.cfg and radiusmanager/config files. Now press i and add the the following entry. it will save the crontab and exit. 12345 is the default password, as it is defined in system_cfg.php. Always specify the full path of the PHP interpreter. If You are not sure, check it’s location before You add the crontab record. The password has to match the predefined one in system_cfg.php. Now Try to access the ACP (Administration Control Panel) by pointing your browser to http://localhost/radiusmanager/admin.php. Reboot your system to check if helper services are starting properly (radiusd, rmpoller and optionally rmconntrack). By default few services donot run at Fed startup, See the last paragraph of this guide on Starting daemons at boot time so that required services automatically starts at boot. You can use the following commands to make sure the services starts at boot time. • Is MySQL server running? • Are MySQL credentials correct? • Are MySQL table permissions correct? • Can FreeRadius connect to MySQL database? • Have You created the RADIUS and CONNTRACK databases and tables? • Is the NAS defined in ACP? In this case it is 127.0.0.1 ? ( NAS-IP-Address = 127.0.0.1). • If the hostname is different than localhost, You have to substitute the localhost with the IP address of the Linux server. You have to update the NAS list in RM ACP in this case. Now access the ACP (Administration Control Panel) by pointing your browser to http://localhost/radiusmanager/admin.php and First add Mikrotik NAS device in ACP. 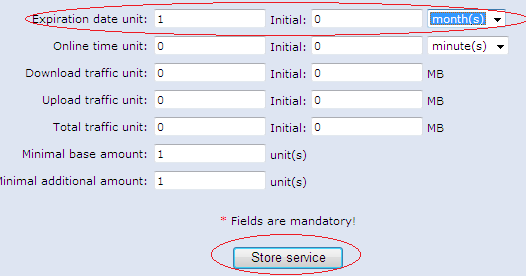 To be able to log on to UCP as another user, create the user in ACP first. 1. Check radacct table size. If it is large (> 300-500 MB), delete the old years from it using the deloldyears.sql script (included in the RM tar archive in doc directory). 2. Add more RAM to the system. Adding 2-4 GB of RAM doesn’t mean any problem nowadays. 3. Use RAID 0 or RAID 5 array MySQL db storage devices. 4. Optimize the MySQL server via my.cnf file. Set key_buffer = RAM size / 2, myisam_sort_buffer_size = RAM size / 4, sort_buffer_size = RAM size / 64. Adding more RAM will drastically speed up the MySQL system. Indexes must be fit in the RAM for optimal performance. 1. Use .htaccess file. Enable the Options -Indexes directive In .htaccess file (example file is included in radiusmanager directory in the installation archive). Be sure to enable the htaccess support in order to use this feature (set AllowOverride All directive in httpd.conf). 2. Disable the directory listing in httpd configuration files. HOWTO REPLACE/MODIFY DMASOFTLAB RM LOGO and TEXT !!! You can Replace/Edit the default DMASOFTLAB logo files. by default, Images are available where you have installed the radiusmanager. Look into the images folder of radiusmanager. 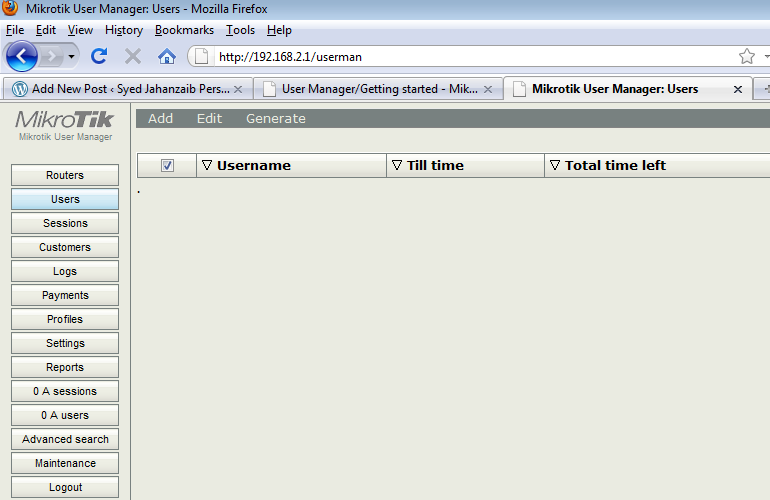 For example I installed RM in /var/www/html/radiusmanager. There will be a folder name ‘images’ Look for these files. You can also edit the texts/descriptions in language description files in radiusmanager/lang/english folder. You can modify its base image at radiusmanager/lang/english/card folder. 1. Connect to your Mikrotik router using Winbox. 2. Select Radius from the main menu. • Authentication and Accounting ports are the standard RADIUS ports. • Timeout defines how much milliseconds can elapse while the answer arrives from the RADIUS server. 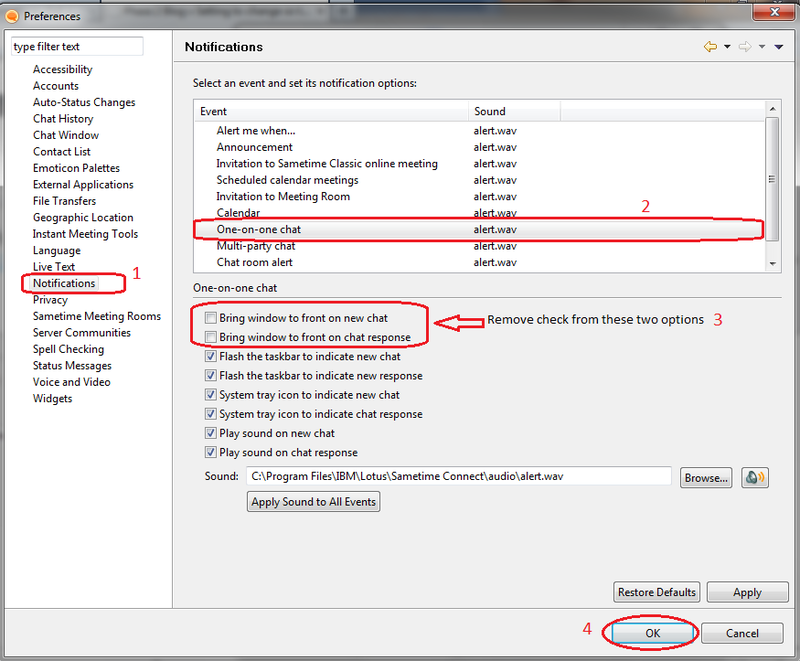 If You are using slower connection to RADIUS server or the accounting tables are large, set this timeout higher (3000-5000 ms). Now Set the AAA options of PPP service (PPPoE): Goto PPP / Secrets / click on PPP Authentication & Accounting Button, and see the following. Turn on RADIUS authentication (Use Radius) and RADIUS accounting (Accounting). 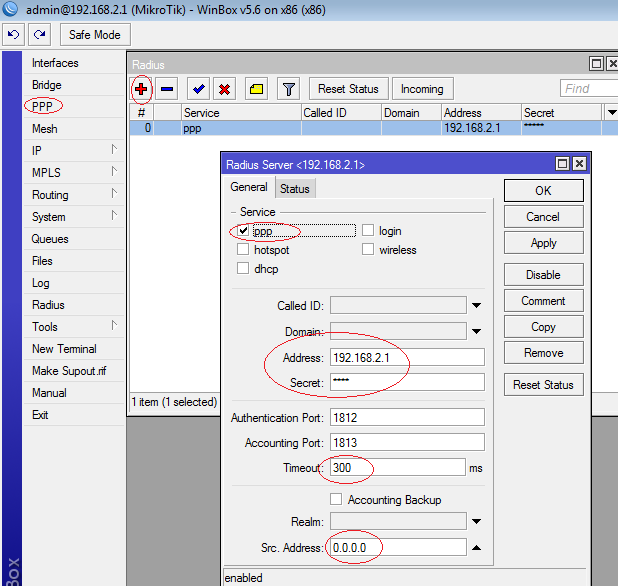 Interim update is the time interval when RADIUS client (Mikrotik NAS) sends the accounting information to the RADIUS server. If You have more than 200 online users, use higher values (5-8 minutes) to avoid MySQL overload. Now Enable incoming RADIUS requests (POD packets). 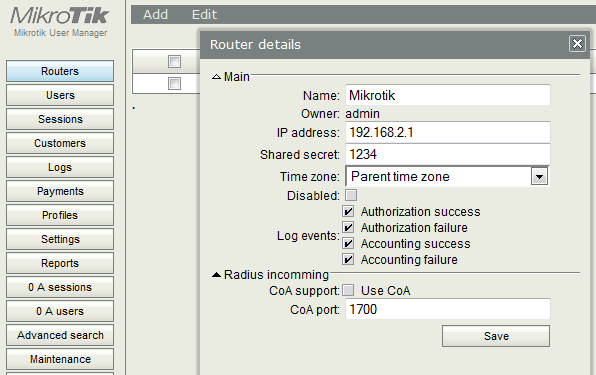 It is required to use the REMOTE disconnection method in Radius Manager: Don’t forget to open the UDP port 1700 in firewall on Mikrotik and Linux server. To Test the database connectivity: use the following command from RADIUS CLI. (Where 192.168.2.1 is the MT IP) You have to see similar output to this. If there is a MySQL socket error, define the correct socket location in /etc/radiusmanager.cfg. The default socket file on Redhat is /var/lib/mysql/mysql.sock. On Debian systems the proper socket path is /var/run/mysqld/mysqld.sock. You have to restart FreeRadius every time when You modify the NAS devices. Unfortunately FreeRadius doesn’t read the configuration files dynamically. 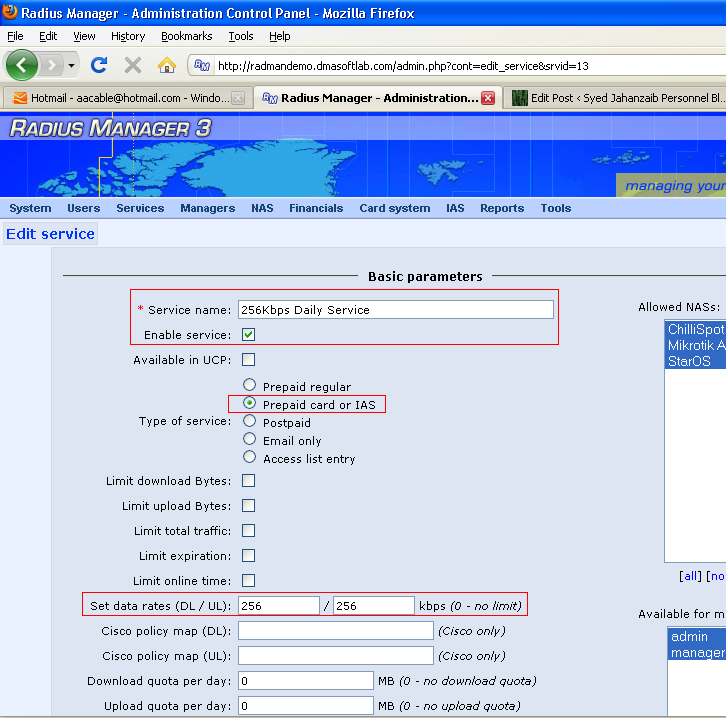 Radius Manager system supports automatic startup of daemons: radiusd, rmpoller and rmconntrack. The automatic installer copies all the required scripts to /etc/init.d directory and sets the required permissions on them. 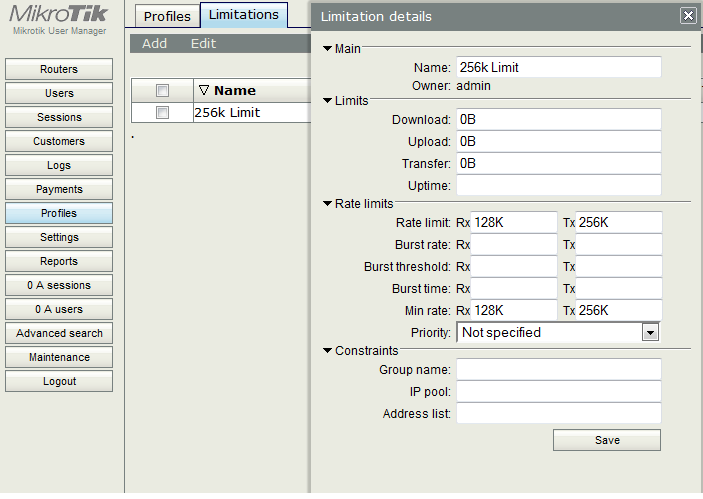 Restrict this id/ip to access only RADIUS Server , block all other access for this id / pass. This way user have to first dialin to open RM User Self Care Portal. Following is an example on howto add New Service and assosicate it with new user. Login to RM ACP , Goto Services and click on New Service. Finally, Click on Store Service Bottom in the End. Done Your new service is created with 256Kbps Speed Limitation with 1 Month Up-Time Limitaion. Following are screenshot for the above created Service. 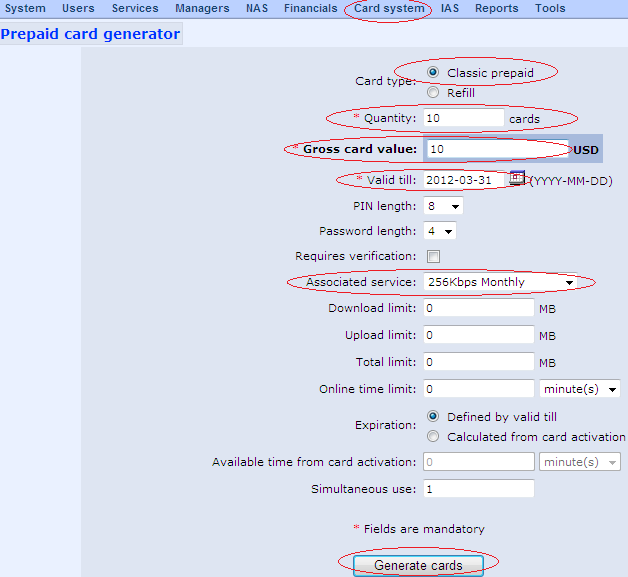 Now we have created the new service , its time to create new user or generate pre-paid cards and assosciate them with this new service plan. Now we will Add Quota Base Service Plan. For example User is allowed to use 1GB @ 1mbps per Day, After using his 1 GB Quota, his service plan should auto switch to 256Kbps speed plan for the rest of teh day. . . We have to use DAILY SERVICE option in RM for this purpose. First create Daily service with 256Kbps limitation, and then create the 1Mbps / 1Gb Daily Quota limit service and use the next dail service option in 1mb service plan to point it to 256k. First we will create 256Kbps service plan. This will be very simple basic plan. 256Mbps – Daily Service , rest of options can be set by seeing the image below. Click on Store Service. Now 256Kbps daily service is ready, its time to create your regular 1Mbps / 1GB daily Quota Service Plan. 256Mbps – Monthly, rest of options can be set by seeing the image below. All Done. 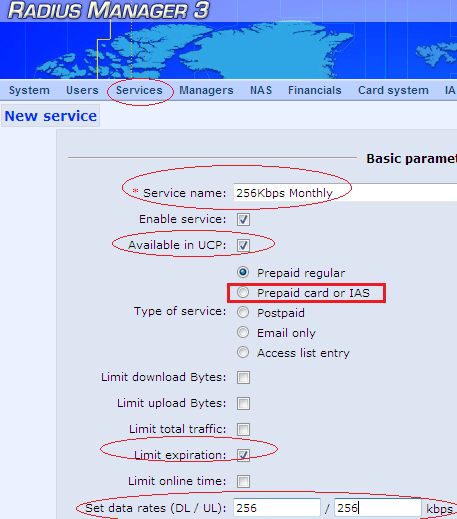 Now Simply generate cards or user ids and associate it with the 1mbps service. Goto Home / system settings , here you can set it. 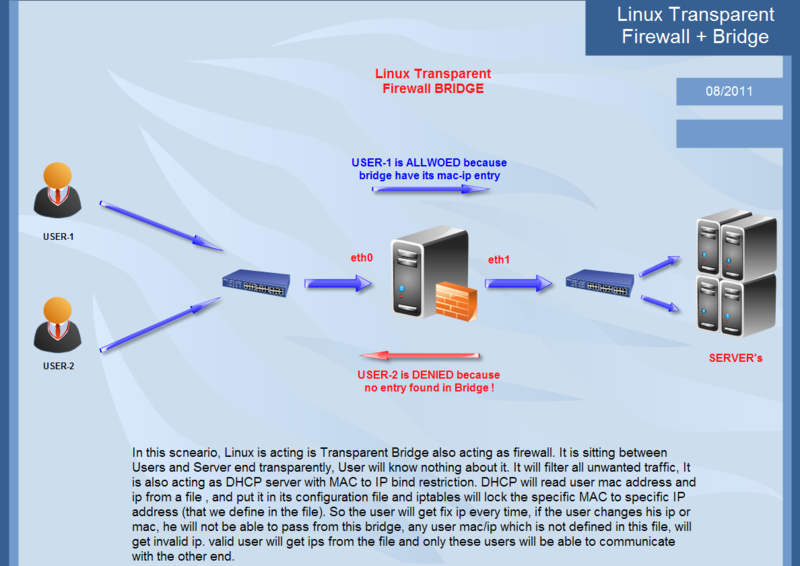 Following is a comprehensive guide on how you can setup Linux base Transparent bridge with advance firewall capabilities like DHCP Server MACto IP binding restriction, Easily add remove clients via single file using text editor or WEBMIN, Also you can Port Filtering to block unwanted traffic from passing through. A bridge is a way to connect two Ethernet segments together in a protocol independent way. Packets are forwarded based on Ethernet address, rather than IP address (like a router). Since forwarding is done at Layer 2, all protocols can go transparently through a bridge.You can think of a bridge like a advance manageable network switch/firewall/router. We will be using this Linux Transparent bridge according to the network diagram shown at the start of this article. You don’t need to change your existing network layout. You just plug in the bridge and you start working. If for some reasons, your Linux bridge box should go down, reconnect the cables from your bridge to your switch, and nobody will even notice that something was not working! The placement of the bridge would be something like. If required, convert them using dos2unix command, as sometimes copying it from windows generates some problems. Now copy rc.local to /etc/ (overwrite older one) & restart the system. Now after booting , rc.local will excute following files . . .
You can view the ‘start‘ file and see the related actions defined in there. Your BRIDGE is ready & Following restrictions will be in place. The user with above mac address will always get the 10.10.2.13 ip, if he manually tries to change the ip or mac, he will not be able to pass the bridge. MAC n IP combination matching is required in order to pass the bridge. If a user MAC n IP is not found in /firewall/aacable/macip.allowed file, User will be granted INVALID ip series from following off subnet 192.168.100.10-192.168.100.200 and thus will be completely isolated from the local valid network. You can change all ip series in DHCP related files. and the run start file which will add entry in macip.allowed file and add dhcp entry and run the security script. OR the easiest way is to setup WEBMIN and link the file with webmin, so you can add/remove files easily via webmin GUI.I have done some advance customization of webmin, I added support user in webmin for support personnel , and grant him only right of editing this file, after the support personnel edit this file and click on save, it automatically execute the start script which add / remove all entries again in firewall. See the below images for example. This firewall script also blocks few ports which are commonly used in virus flooding. thus saving junk traffic from passing by from one end to other end. Note: Later on, I moved FTP servers from Mikrotik DMZ to User Subnet, I also changed FTP operating system from Microsoft Windows 2003 R2 Server to Ubuntu Linux and set all sharing via Apache and linked apache authentication with Radius Manager , This step was done because there was unnecessary junk load of FTP data going through Mikrotik router , so I placed them on user subnet and put radius authenticaiton on it, so only valid account holder can access it. I have also posted an article on my blog website on how I achieved it.